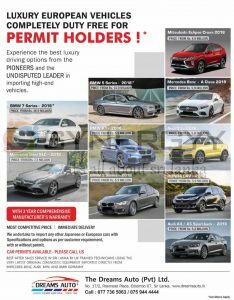 Dreams Auto announces their updated prices for range of luxury European vehicles completely duty free for Permit Holders. With 3 year comprehensive manufacturer’s warranty with most competitive price & immediate delivery. We undertake to import any other Japanese or European cars with Specifications and options as per customer requirement, with or without permit.